[T]wo documents strongly back Gaddafi on this issue. The first is a secret cable to the State Department from the US embassy in Tripoli in 2008, part of the WikiLeaks trove, entitled "Extremism in Eastern Libya", which revealed that this area is rife with anti-American, pro-jihad sentiment. According to the 2008 cable, the most troubling aspect "... is the pride that many eastern Libyans, particularly those in and around Dernah, appear to take in the role their native sons have played in the insurgency in Iraq … [and the] ability of radical imams to propagate messages urging support for and participation in jihad." The second document, or rather set of documents, are the so-called Sinjar Records, captured al-Qaeda documents that fell into American hands in 2007. They were duly analysed by the Combating Terrorism Center at the US Military Academy at West Point [which found that] one country provided "far more" foreign fighters in per capita terms than any other: namely, Libya. The West Point study of the Sinjar Records calculates that of the 440 foreign al-Qaeda recruits whose home towns are known, 21 came from Benghazi, thereby making it the fourth most common home town listed in the records. Fifty-three of the al-Qaeda recruits came from Darnah, the highest total of any of the home towns listed in the records. The second highest number, 51, came from Riyadh, Saudi Arabia. But Darnah (80,000) has less than two per cent the population of Riyadh. So Darnah contributed "far and away the largest per capita number of fighters". Dernah is the hometown of the highly-troubling rebel warlord Sufayn bi Qumu. A suspected al Qaeda member, he was held at Guantanamo Bay for six years, and now trains rebel troops and heads a Dernah brigade. Abdelkareem al-Hasadi was also, more briefly, passed through that system, before winding up back home and, reportedly, declaring an Islamic emirate after the rebellion started. (see below). He had acknowledged al Qaeda links and that others of his comrades from abroad are involved in the fighting, but to Western cameras, it's all about Libya alone, and he doesn't support 9/11. Al-Qaeda has set up an Islamic emirate in Derna, in eastern Libya, headed by a former U.S. prisoner at Guantanamo Bay, the country's deputy foreign minister told EU ambassadors in Tripoli. However, residents in the city have told reporters there is no substance to these rumors, which they claim the Libyan government is sowing to "scare Europe." "They have an FM radio station and have begun to impose the burqa" (head-to-toe covering for women) and have "executed people who refuse to cooperate with them." Khaim said Hasadi has a lieutenant, "also a member of al-Qaeda and named Kheirallah Baraassi" in al-Baida. Residents openly acknowledge that scores of young men from Derna fought in Afghanistan and Iraq, and that some of those who returned are now helping the rebel cause. Yet similar anti-western sentiment would have been felt across much of the Arab world. So why did so many young people from Derna in particular choose to seek martyrdom? The answer to that is not easy. 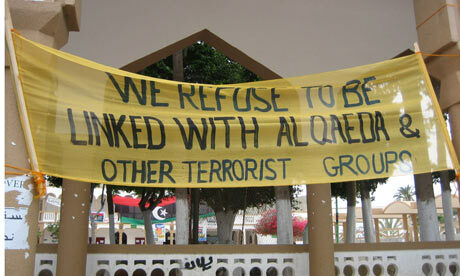 The town may be more religious than many others in Libya, but still appears to be fairly moderate. Indeed, many people here say the radicalisation had less to do with religion than Gaddafi's oppression and deliberate neglect of the town. "There were no jobs for young people, no money, a lot of men in jail. People thought there was no future under Gaddafi so they started to get other types of thoughts," said 34-year-old Faraj al-Faitory. Others said Gaddafi, who was one of the world's biggest sponsors of terrorism in the 80s and 90s, actively encouraged young people from Derna to join jihad, helping them obtain the necessary travel documents. There is no way of proving that. What is certain is that there has long been opposition to Gaddafi in Derna – dating back to 1970, a year after he took power, town elders say. In turn, the town has been punished. Indeed, to people In Derna the biggest danger to Libya is the man still clinging to power in Tripoli. In the town's training camp, Siraj Abidi, a 28-year-old farmer, was learning how to clean and reassemble an anti-aircraft gun. "Gaddafi is the terrorist man," he said. "We are just ordinary people." Derna fighters in Syria, allegedly. Tawasul news agency, Fb page. 18 July 2012. Mentions too groups from Zintan, Misrata, Tripoli, Benghazi.